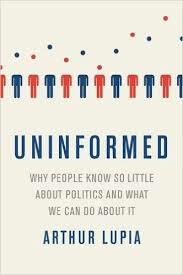 Uninformed: Why People Know So Little About Politics and What We Can Do About It. Arthur Lupia. Oxford University Press. 2016. Since the seminal contributions of Philip E. Converse (1964) and Stephen E. Bennett (1988), political ignorance has drawn the attention of political scientists. In Arthur Lupia’s words, ‘when it comes to political information, there are two groups of people: one group understands that they are almost completely ignorant [… and] the other group is delusional about how much they know’ (3). This casts shadows on democratic quality: how can democracies function if voters are uninformed – if not misinformed? How to hold political leaders accountable, if they can exploit ignorance? Uninformed: Why People Know So Little About Politics and What We Can Do About It, by Lupia, builds upon decades of research in different fields, not only describing what we know about political (un)information, but also suggesting strategies to overcome the problem. Lupia indeed argues that the root of enduring political ignorance partially lies in the misunderstanding of ‘civic educators’, who believe that merely exposing the public to facts will increase competence. The book, however, does not simply criticise this approach: its aim is to draw up strategies for civic educators, so that they can ‘provide more information of more value to more people’ (21). Hence, Part I of the book discusses what political knowledge is, and how to achieve effective communication; Part II instead focuses on the measurement and interpretation of survey data. The first – and most important – message discussed in Part I is that there are trade-offs in what the public can learn. Consequently, anyone willing to convey information must select what is necessary and sufficient to achieve the desired level of public competence. Individuals have varying levels of background knowledge, contrasting interests and different value-systems. The search for a ‘silver bullet’ that informs all audiences is thus an impossible mission. This is why the two central topics of this section are: (1). how to attract the attention of the public; and (2). how to manage the diversity of value-systems. Given that the public ignores most of the information to which it is exposed, an ‘informer’ must achieve perceived credibility. However, as Lupia underlines, this is only a necessary, but not sufficient, condition for effective communication. What an ‘educator’ needs is to attract attention. To do so, the author suggests speaking to the audience’s fears and aspirations. These are the two stimuli – as research in cognitive psychology has found – that are most likely to stimulate focus and activate memory. What is, however, missing from this chapter is a distinction between the two. Since positive and negative emotions can lead to different cognitive results (see, for example, Fredrickson, 2001), this is an important discussion that ‘civic educators’ should be aware of – particularly in an age of increasing populism. As in the case of credibility, attention is only a necessary, but not sufficient, condition to stimulate learning. Values shape and affect the acquisition of information. Lupia underlines that ‘if prospective learners see the information as sufficiently related to their values, then prospective learners will have greater motivation to use the information in the way that the educator desires’ (106). Since values are diverse and often contrasting, Chapter Ten focuses on diversity management. Lupia thus addresses one of the most compelling tasks for political communicators, and challenges the simplistic approach of averaging positions into a mean one. Such a strategy would be ineffective, since the average value-system might correspond to none of the actual individual positions within the public. Instead, he argues, an ‘educator’ should acknowledge the variance in values, and find the ‘sweet-pots’ that grant the highest level of acceptance. For instance, in an audience formed by two groups, the ‘educator’ should either find the common ground or highlight the reasons that can make the ‘loser’ tolerate a trade-off, in light of an accepted value. If Part I concentrates on why political ignorance exists and on how to overcome it, Part II discusses the measurement and interpretation of ‘recall data’. Indeed, ‘better measurement and more accurate inferences from data can help educators more effectively diagnose whether individuals have the knowledge they need to achieve desired competences’ (191). There are two central arguments. Firstly, ‘competence […] does not require the ability to recall all the facts’ (194). Secondly, it is necessary to understand what recall questions uncover about sophistication. Using examples from surveys of the US public, Lupia shows how – as other scholars have also found – political ignorance is often overestimated: ‘the irony here is that many scholars and pundits feel free to castigate the public for its ignorance […] without checking their own facts first’ (212). The main takeaway is that any ‘educator’ should know what the data is really telling, and whether other factors influence the frequency of ‘don’t know’ or ‘incorrect’ answers. Part II hence proposes how to build better surveys and to assess the results of research, arguing for an analysis of individual results over aggregate measures or scales. Uninformed thus expands on a mere revision of what we know about political ignorance, offering practical strategies to inform the public and read sophistication data. Albeit not addressing distinctions between positive and negative emotions, the book constitutes one of the best reviews on political ignorance. It addresses the most compelling challenges that any educator will encounter in the endeavour of political education. This book should thus be in the collection of anyone interested in public opinion: while policy-makers and practitioners will benefit from the topics covered in Part I, students, scholars and public opinion analysts will find vital information on data measurement and interpretation in Part II. Moreover, given the sensitivity to ideological diversity that political communication entails, the application of the proposed strategies can be adapted to a wide range of fields. In other words, the potential readership of the book is not limited to political ‘instructors’, but to anyone interested in education and effective communication. Note:this post represents the views of the author and not those of Democratic Audit or the UK. Please read our comments policy before posting. It originally appeared on the LSE Review of Books. Michele Fenzl is a MPhil/PhD student in the Department of Government of the University of Essex. He holds degrees from the University of Bologna and University of Essex; and has previously held visiting positions at the University of Sussex and King’s College, London. His PhD thesis studies the comparative political economy of income inequality and redistribution, and adopts quantitative methods to analyse the intersections between economic and political inequality.